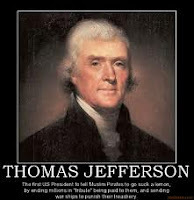 POLITICAL POLICY: GOVERNMENTAL ACTIVISM v. JEFFERSONIAN PROPHECIES: THE CASE OF THE "WILL OF THE PEOPLE"
GOVERNMENTAL ACTIVISM v. JEFFERSONIAN PROPHECIES: THE CASE OF THE "WILL OF THE PEOPLE"
Thomas Jefferson was a constitutional clairvoyant. He issued warnings to protect the integrity of the U.S. constitution as a social compact founded in the authority of the people. Jefferson visualized that the Republic could result in nascent activism by each of the three branches of government that could systematically usurp the free will of the people. When opining on the foundation of government, he warned that, “The will of the people is the only legitimate foundation of any government, and to protect its free expression should be our first object." In our age of legislative, executive and judicial activism, Jefferson’s prophetic warning has been cast aside by replacing the phrase “will of the people” with “will of political and ideological expediency”. “I am for preserving to the States the powers not yielded by them to the Union, and to the legislature of the Union its constitutional share in the division of powers; and I am not for transferring all the powers of the States to the General Government, and all those of that government to the executive branch”. The passage of the federal ObamaCare legislation by the progressive/socialist democratic congress was the most sweeping legislative affront to Jefferson’s warnings on subverting the will of the people (and the tenants of the Constitution). ObamaCare’s unpopularity among the electorate has increased markedly ever since its passage, when the progressive/socialist democratic leader Nancy Pelosi announced, “We have to pass the bill so you can find out what is in it”. However, in the face of such anti-Jeffersonian progressive/socialist legislation, the will of the people is still strident. Missouri voters approved a measure aimed at nullifying ObamaCare, becoming the first state in the nation where the will of the people made known their disapproval of federal legislation impinging on their individual freedoms. Residents in Arizona and Oklahoma are expected to cast ballots this year on amendments to their Constitutions with the same aim. Lawmakers in five states have also enacted measures aimed at nullifying ObamaCare and at least 22 states filed lawsuits challenging ObamaCare. "But the opinion which gives to the judges the right to decide what laws are constitutional, and what not, not only for themselves in their own sphere of action, but for the legislature and executive also, in their spheres, would make the judiciary a despotic branch”. Jefferson’s fear of judicial despots through activism have borne itself in the recent Arizona and California judicial rulings. Judicial rulings on the Arizona state legislature’s immigration law (SB 1070) and California’s Proposition 8 are palpable evidence that Jefferson’s “will of the people’s” free expression is being undermined systematically by an activist judicial system. His prophetic “I told you so’s” on judicial despotism are now manifested in free-form judicial interpretation. Arizona’s immigration law SB 1070 was enacted by its state legislature simply to enforce federal immigration laws. California’s Proposition 8 was a voter ballot and California constitutional amendment ,which provides that only marriage between a man and a woman is valid or recognized in California. Both of these state laws were enacted as a representation of the of the will of the people, and in both cases their will was struck down by activist judges. Arizona’s immigration law was clearly a piece of legislation that was unquestionably popular and necessary in the minds of the people. According to a recent Quinnipiac poll, 55% of Americans back the Arizona law and 58% disapprove of President Obama's immigration policies. A Pew Research Center poll shows 63% think immigration reform is very important. However, federal District Judge Susan R. Bolton’s un-Jeffersonian activist ruling on the law blocked critical aspects of Arizona's immigration enforcement law. Notwithstanding Bolton’s activist ruling, Arizona will continue to move forward to defend its residents will by revising its legislation to comport with Bolton’s activism. In addition, other states considering similar legislation will continue to monitor Arizona’s fight to defend the will of the people and follow suit. As with the ObamaCare and Arizona rulings, the will of the people is fighting back . In an emergency appeal now before a federal court, the backers of Proposition 8 have asked for a permanent hold on last week's "egregiously selective and one-sided" marriage ruling, contending it flouted the law and ignored the evidence. “Let the national government be entrusted with the defence of the nation, and its foreign and federal relations; the State governments with the civil rights, laws, police, and administration of what concerns the State generally; the counties with the local concerns of the counties, and each ward direct the interests within itself." In each of the above cases, those dedicated to preserving Jefferson’s respect for the will of the people have admirably challenged the presidential and congressional progressive/socialist forces who are dedicated to dismantling it for political and ideological purposes. There has been a new atmosphere in our collective political society since the Obama, Pelosi and Reid progressive/socialist regime has undertaken power. It is one of anti-founding fathers and anti-constitutional traditionalism, with a goal of reconstituting America as a social democratic welfare state. Challenges to the onslaught of legislative, judicial and executive anti-Americanism has reinvigorated many American’s love and respect for their founding fathers' wise and sage guidance that constituted this great nation. Yes, we can continue to challenge those in power who disrespect America’s core Constitutional values and insidiously plan to dismantle it piece by piece. However, the solution to overcoming this new regime is to vote for the most electable candidates on November 2, 2010 who stand for the Jeffersonian principles that served to make America the “shining city upon a hill”. Through that effort we will reinstate America’s guiding principles of greatness and thwart Jefferson’s darkest prophecies. Through that effort the spirit of Thomas Jefferson will smile once more upon the “shining city upon a hill”. I would like to propose a link-exchange. If you are interested please send me an email at ursul3tz@gmail.com for details. Have a nice day. Your call to vote in 2010, is still needed. I believe that the answer to what is wrong currently with America can be answered by turning back to the Founding Fathers.